Tonight we’re eating homemade, authentically southern bread pudding, made by an authentic southerner. T: This was the dish I had been waiting for for weeks! A: Woo Hoo! it’s here! it’s finally here! T: It was good too. This is one of your top desserts, in my opinion. I’m glad we’re finally getting a chance to blog it. A: i know, it’s definately the one dessert we eat the most of, but somehow it has seemed to slip through the blogging cracks. T: We have not done an enormous amount of dessert blogging… until recently that is. A: and now it’s just dessert, after dessert, after dessert….. okay.. maybe not that much dessert.. but for a savory girl, it has certainly felt like that! T: yup, two days in a row. Although, let us not forget, we have been eating savories in between! A: hehehe true dat. i’ve just been ingesting more calories than normal with this influx of sweets. T: I guess that’s true. well, I give the bread pudding a 4.6/5. I really like it, and I would like to eat it for breakfast every morning. Perhaps with an extra dose of whiskey sauce. A: heheh get your day going right! there is definately a lot of bread pudding left for you to devour tomorrow morning. I give the bread pudding a… 4.2/5 it was good, but i think i was just not that in the mood for sweets. T: heard that. So, what were you saying earlier about the odd mix of sweeteners you used in this batch? A: oh yeah… i had (or at least thought i had) everything ready to make this delightful dessert, but as i went to mix the eggs, milk and sugar, i realized i HAD NO SUGAR. now how you gonna make bread puddin’ and wiskey sauce w/o sugar, amanda??? i’ll tell you how (it kinda feels weird talking to myself on the blog). I found every sweetening agent in the house and combined them until i found the appropriate level of sweetness. I started with what little brown sugar we had left, then added a heafty pinch of splenda, then when that still wasn’t sweet enough i turned to powdered sugar. and finally, it was sweet enough. before making the wiskey sauce i gave in and made another trip to the store, my fourth of the day. T: damn, girl, you’ve been to the grocery store four times today? A: yeah. and that’s not even counting going to pier one, linens-n-things, world market, and marshalls. WAY TOO MANY stores for this non-shopper. T: jeeez. I’m glad I was just sitting in front of the computer thinking about Bob Sagget all day! A: LOL you are TOO funny. i have to admit, it wasn’t all that bad. i walked to 6 of the 8 stores i went to today, and it was quite a nice day. T: … did I go outside today? I can’t remember. A: hehehe i was just thinking about that.. i don’t think you did…. ohp! i’m wrong, you went to the garage for squirt and tp. T: Oh, yes, ah ha! You’re right. That makes me feel… not much better about the situation. Oh well, we will have to hit up the beach after work tomorrow. A: for sure, i can’t believe we didn’t make there today. A: man, when you put it that way, it sounds like we lead a pretty sad life! T: wow, you’re right. it sounds really really terrible. But, I *like* bob sagget, so it’s ok.
A: woah… is there something i need to know about? is this bob sagget thing spirling out of control?? T: i thought you knew about this. A: i mean, i know you like bob sagget, but thinking of him all day… just kinda creepy, don’t you think?? T: IT’S NOT CREEPY! LEAVE ME ALONE! A: simma down now, homes. it’s alright.. if you want to like bob sagget THAT much, you can. just… maybe… don’t let EVERYONE in the world know about it. they might stop reading our blog!!! T: if they stop reading our blog because I like… love bob sagget, then we didn’t need them anyway! A: dude! we only have, like, three or four readers.. they could be sensitive about the subject. T: well, i can offer them bob sagget therapy if need be. A: oh jeeze.. this blog has taken a turn for the… uh.. worse. So anyway, back to that uh.. bread pudding, yeah.. that’s what this blogs about. T: Bob Sagget loves bread pudding. A: *cringe* i suppose my subject change didn’t work. 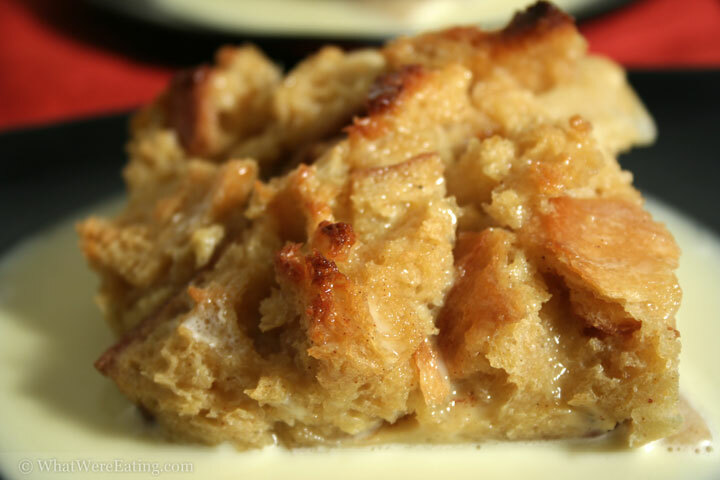 I was delighted with the outcome of this bread pudding, it was wonderfully moist on the inside, and the top layer had a nice crunch to it from the butter. The apples added a lovely texture as well. T:Oooh I agree completely. They are a wonderful compliment to the mushily wonderful texture. I can’t wait for the next one! As an authentic Southerner, I also looove bread pudding of all shapes and sizes. I am now struck with the impulse to make some bread, just so I can make the pudding with the leftovers. Hmm. Anyway, I love your blog, you two are quite clever and very cute. Denise: see… i’m good for my word! and i think you will be quite satisfied with the results when you make it. if you have any questions about the recipe, just ask! Excellant recipe. The entire family enjoyed it. However may I suggest before posting recipes that you use the grammer and spell check feature.